Opening Night Gala at the Historic Leith Church is already sold out. Sold out crowd is pictured here in Leith at SweetWater 2016. 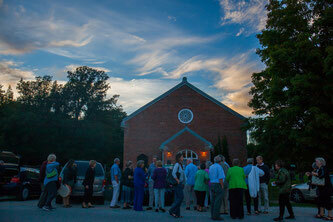 The 14th SweetWater Music Festival begins on Friday evening with an Opening Night Gala at the Historic Leith Church. This sold out concert is the first of four concerts along with several free events over three days. Festival Passes are also sold out but single tickets are still available for both Saturday evening concerts as well as the Sunday matinee finale. Remaining concert tickets are available online and at the Roxy Theatre Box Office (519 371 2833). Concerts at the Roxy are $35 and Heartwood After Hours jazz concert is $30. Artistic Director Mark Fewer has once again assembled a stellar line up featuring some of the world’s top musicians including James Campbell, John Novacek, Russell Braun, and Edwin Huizinga. SweetWater 2017 features well-known classical works, contemporary works, as well as original Canadian jazz. SweetWater has an all-Canadian line up as part of a double concert Saturday night to mark Canada 150. Glorious & Free , 7 p.m. at the Roxy Theatre, features works by some of Canada’s greatest composers. It opens with baritone Russell Braun performing John Estacio’s Away and Awake accompanied by pianist Carolyn Maule. The concert includes a new work by Richard Mascall. Later the music moves to Heartwood Hall in downtown Owen Sound for the Canadian-themed jazz concert, After Hours. This high energy concert, featuring Juno winner Duane Andrews, will offer up the best of original Canadian jazz. The festival finale. Pianorama , 2 p.m. on Sunday at the Roxy Theatre features pianist Kati Gleiser performing one of Mozart's greatest works for piano, Concerto in A Major, K 488. After the intermission, Guy Few and John Novacek will perform Shostakovich’s Piano Concerto No. 1. Along with the concerts, SweetWater 2017 has four FREE events at the Harmony Centre in Owen Sound beginning at 9:30 a.m. with the Musical Petting Zoo. Mozart for Munchkins, a family favorite, returns at 10 a.m. led by SweetWater headliners Edwin Huizinga and Duane Andrews entertaining young and old with light classics and more. SweetWater’s annual Luthier Exhibit features some of Canada’s best string instrument makers. It’s a unique opportunity to see these string instruments up close. Several of SweetWater’s featured performers will also perform on instruments made by Canadian luthiers. The special free concert at 1 p.m. on Saturday features string players Edwin Huizinga, Drew Jurecka, Rory McLeod and Amahl Arulanandam along with acclaimed clarinetist James Campbell performing Mozart’s Clarinet Quintet, K. 581in A major.